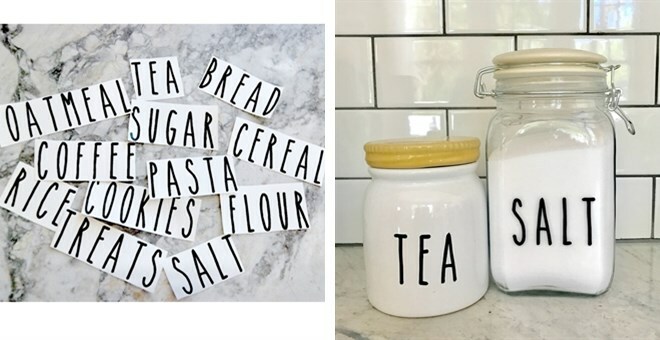 Rae Dunn Inspired Decals for Your Pantry - Only $6.99 for 12! 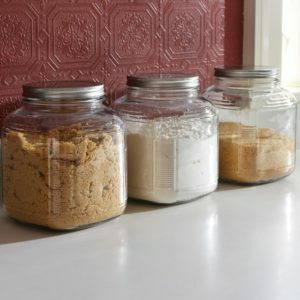 Rae Dunn Inspired Decals for Your Pantry – Only $6.99 for 12! January 4, 2018 by Laurie Leave a Comment This post may contain affiliate links, which means if you click on a link and purchase something, I may earn a small commission (at no additional cost to you.) See my disclosure policy HERE. I love the Rae Dunn originals – but if its just not in your budget then these are a cute way to get a similar effect! Labels come in a black matte finish using high quality permenant vinyl. All labels have a easy to use transfer tape and comes with step by step instructions. *Shipping adds $2.61 for the first item and only 25¢ for each additional item from this seller. Would make a cute gift for a friend – especially when paired with a new set of canisters like these! Night Owl Deal Alerts – A Story of Two Boxes! Long Sleeve Tops Blowout $12.99!!! Payless Shoes | Buy One Get One 50% Off! Valentine's Day Nail Wraps $5.99! Kohls Saddle Seat Counter Stools only $26 Shipped! Banana Republic Clearance from $4.38! Plaid Trim Tunic $19.99 Shipped! Dash Pink Waffle Maker only $7.99 Shipped! Valentine's Day Decorative Pillow Covers under $4 Shipped! CUTE Disney Inspired Graphic Tees $13.99! Danskin Women's Workout Leggings only $2.50! Graco LiteRider Click Connect LX Stroller and Cart Seat Travel System $125.99, Shipped! Chalkboard Menu + 8 Markers only $16.88! Personalized Long Sleeve Pocket Tees!! Cents of Style: Long-Sleeve Valentine Tees $16.95, Shipped! Zulily: Duck Boots from $16.99 + FREE Shipping! Walmart: Women's Down Puffer Coats only $8.50! Nutri Ninja Blender DUO with Auto-iQ $69.99, Shipped!